When putting in new windows it is important to take style into consideration. Are you going to go with double hung? Bay or picture windows? Do you want round or square glass? Single or multi-panel windows? The possibilities are endless to find the right fit for our home. One thing to consider is space, do you want to make your home look roomier and bigger? You have to also consider that the style of your house, some window styles look better on a colonial vs a ranch style home. There are an estimated 7 styles of windows to choose from. Each with its benefits. The styles to choose from are double hung, slider, casement, awning/hopper, picture, bay/bow, and garden windows. The double hung window is one of the most common styles of the window for traditional homes in the United States. Double hung windows are made of two sashes that slide up and down. Newer versions of the double hung window like those found in the HR40 windows, tilt in for easier cleaning. Because of how the sashes move, the window screen is located on the outside. The style compatibility with different types of homes contributes to the popularity of double hung windows. A slider window, like the double hung, is made up of two sashes. But instead of sliding up and down, they slide side to side. The bottom tracks require routine use for continued ease of open. Casement windows have one sash which is hinged to swing like a door. When open it leaves the entire window completely open for maximum airflow. The screen in mounted on the inside since the sash swings outward. Casements have been noted to work and look best on prairie and contemporary style homes. It is generally operated with a crank. Casement windows are usually found on Tudor style homes as well craftsman, Prairie, and French country. Take a casement window and install it on the side and you’ve got an awning window. Unlike the casement, an awning window is hinged on the top instead of on the side. This comes in handy when it rains and you still want some fresh air. Since it opens out and up, the rain will land on top of it instead of flowing inside. Don’t leave it open if it’s windy and rainy because the wind might blow the rain right into your home. A hopper window is also like casement on its side. It is hinged on the bottom and opens in not out. The screen for a hopper is mounted on the inside. Hoppers are generally used as basement windows. Both types of windows look great in both traditional and modern style homes. Bay and bow windows are three or more windows combined in an angle that protrudes out of the house wall. They can be a combination of double-hung, picture or casement windows. It all depends on what the homeowner wants. Bay and bow windows give your home a dramatic look and open up a room. They also let it a lot of natural light. The best way to describe the garden window is like a box window. Its boxlike nature allows the perfect amount of light to filter through for growing plants and herbs. It is also called a kitchen window, as it is typically mounted in the kitchen. Garden windows look great on all types of houses as long as it fits. 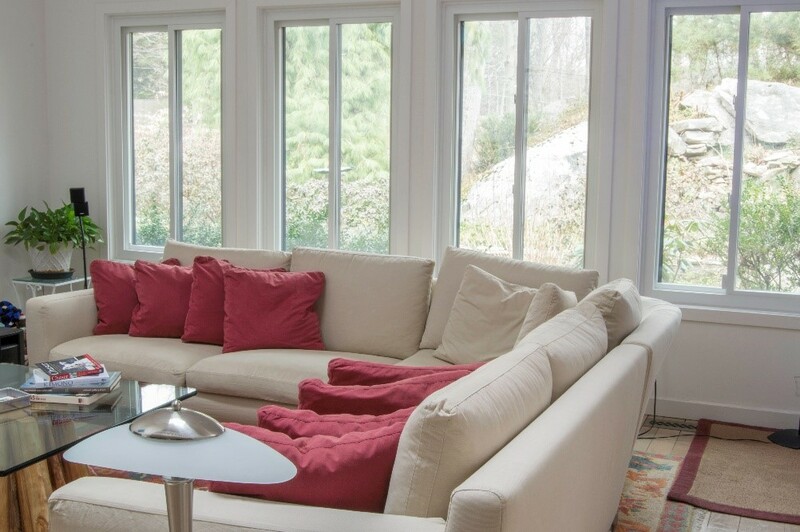 Picture windows like, bay and bow, are great for letting in a lot of natural light. These windows don’t open at all. They work great in sunrooms and living rooms. Picture windows look great on both traditional and modern style homes. You can always do a combination of 2-3 of these window styles in your home. The energy efficient HR40 window comes in all of these styles as well as any custom styles you might want like half circles. Get a free estimate on HR40 windows to learn more.